On April 28, 2017, the World Intellectual Property Day was celebrated. The Property Rights Alliance (PRA), publisher of the annual International Property Rights Index (IPRI), sent a letter last April 25 to the head of WIPO, below. 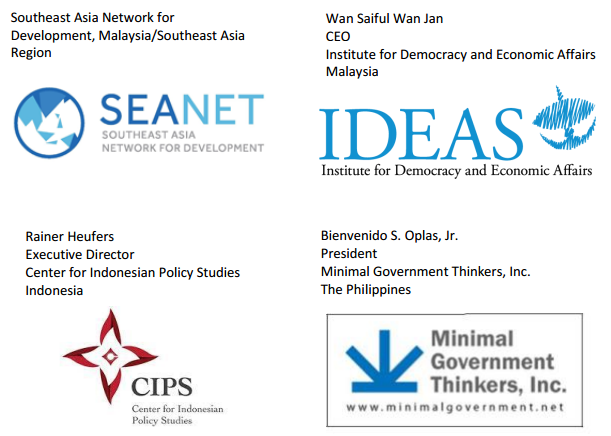 MGT is one of four ASEAN-based free market think tanks that signed the letter. We the undersigned are proud to celebrate World IP day with the World Intellectual Property Organization (WIPO). Intellectual property (IP) rights play a crucial role in growing economies, driving innovation, and saving lives. Robust IP systems provide the greatest incentives for innovators to create the next generation of goods and services, artists to produce original works, and entrepreneurs to enter the marketplace. They also allow for the sharing of knowledge and technological advancement. Invention comes out of the shadows with good intellectual property protections. IP-intensive industries are the cornerstone of modern economies. Between the U.S. and E.U., IP-intensive industries employed between 30%-38% of their workforces—more than 127 million jobs. As a matter of fact, these industries are responsible for generating nearly 40% of the combined US & EU gross domestic products. IP-intensive industries in these economies paid workers 46% higher wages than those employed in comparable jobs in non-IP-intensive industries. Similarly, per capita income in countries with robust property right is 21 times more than per-capita income in countries with weak protections. Human ingenuity is boundless, and IP rights create an environment where human creativity can be unleashed. In 2015, a record 2.9 million new patents were filed worldwide—ranging from groundbreaking technological processes to cures of catastrophic disease to modernizations of everyday conveniences. To thrive, innovation must be protected. Enforcement of IP rights prevent production of counterfeits that undermine economic growth and finance criminal organizations. This underground economy is responsible for nearly 2.5% of global imports, threatening iconic retail brands and next-generation medicines alike. Copying is not the same as inventing. engineers, and inventing new driverless car technologies aimed to reduce traffic deaths and save time, a truly non-renewable resource. However, the intellectual property that delivers these benefits and many others has never been more at risk. Even within the United Nations system, initiatives such as the High-Level Panel on access to medicines threaten to undermine the very protections that are so necessary to solve today's global challenges. WIPO must play a more active role in informing international debates. Therefore, the undersigned call on WIPO to 1) review the ways that IP enhances economic development and access to new products; 2) proactively work with countries to stabilize, grow, and enhance their IP regimes and protections; 3) support IP as a property right and a right to enhancing human growth and development, and oppose adoption of policy to the contrary such as the UN High-Level Panel report. and to produce complimentary efforts aimed at accelerating the adoption of robust IP protections across the world that make intangible futures tangible. BWorld 45, Asia Liberty Forum and property rights, February 29, 2016BWorld 81, Property rights are human rights, September 30, 2016.